A record breaking game of the year, with over 50 Million Downloads worldwide, this little cute creatures are taking the spotlight. Sharing Despicable Me Minion RUSH Android and iOS Game has intrigued me to provide an easy download links, and don't worry cause its free, available on iOS app store and GooglePlay for Android. Being on the top of free games on App Store with an average rating of 4.5/5 which is extremely high and lots of good customer feedback. Minion Rush its not over in version one, as developers are making new ways to add more excitement and adventure, featured with new environment, new costumes, and new challenges, a full 3D game suitable for kids and kids alike. The main game of Despicable Me Minion RUSH is that you control the Minions rather than the main protagonist of Despicable Me 2, but of course Despicable Me Minion Rush is still inspired by the movie Despicable Me 2. An adventure game that mixes with traps, bananas, enemies, and boss fights. A full new environment: El Macho’s Lair, including the film’s new villain El Macho and the purple Evil Minions. New costumes for Minions: The Golfer and highly popular “Bee-do” alarm Minion! Despicable Me Minion Rush Update Download Links for App Store and Googleplay Store. Note: So, what are you waiting for? Download now for free on your smartphones and tablets! If you happen to play this game, kindly share your experience with us! 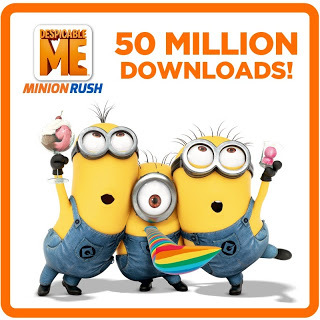 Minion Rush is probably the best endless runner to date and its 50 million+ downloads milestone proves it.